Enforcers know that achieving results does not always require violence - sometime the threat of it is enough. If they need to fight, however, they can brawl with the best. 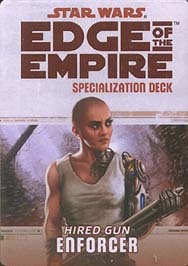 This deck requires the Edge of the Empire Core Rulebook and Dangerous Covenants. It includes cards for all 20 talents available in the Enforcer specialization.